The Provolt9 provides steady, trustworthy power that you can rely on, so all of your pedals are working properly. It features short protection and auto recovery as well as an auto voltage controller that delivers the ideal output of each pedal on your board. If any of the Provolt9 DC outputs are accidentally shorted, this feature protects the internal circuitry from damage while keeping all other outputs active. When the cause of the short is removed the affected output will recover automatically and normal DC supply will resume. Although the output from most power supplies designed for use with effect pedals is 9 volts DC, the output from a brand new battery can be anywhere from about 9.4 to 9.8 volts. It's a small difference, but it can mean a noticeable change in sound quality. 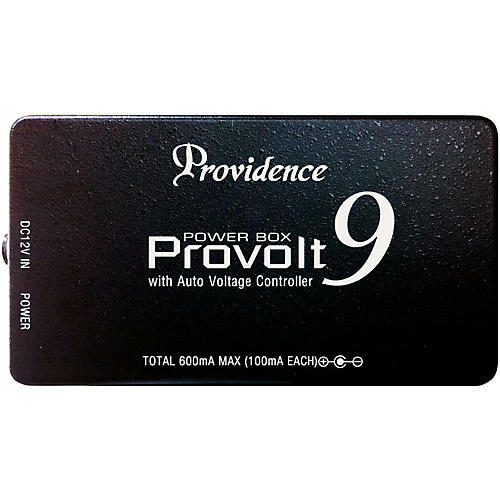 The Provolt9 Auto Voltage Controller ensures that approximately 9.6 volts DC (equivalent to a new alkaline battery) is consistently supplied to booster, overdrive, distortion, and other low-power-consumption effect pedals that need to deliver outstanding dynamic performance. That 0.6 volt difference can be a significant sonic advantage. Double Filtering on each of the Provolt9 outputs ensures exceptionally clean power supply. Clean power is essential for highresolution, refined sound. In most power supplies with multiple outputs the DC output jacks are simply connected in parallel – a configuration that increases the likelihood of hum. The Provolt9 employs star grounding that effectively suppresses hum for clean, high-quality sound.